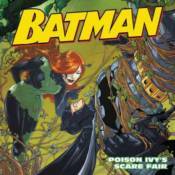 Batman and Batgirl take on Poison Ivy's vengeful vines in this brand-new 8x8 storybook, the thirteenth in the bestselling DC Comics classic program, based on the world's greatest heroes and villains. The county fair is jam-packed with revelers enjoying the food and judging the county's largest fruits and vegetables. But the fun turns frightful when Poison Ivy steps out of the blue-ribbon pumpkin and ensnares the citizens with her vines. It's up to Batman and Batgirl to nip Ivy's plan in the bud!